Henry Louis Gehrig, (born Heinrich Ludwig Gehrig 19 Juin 1903 – 2 Juin 1941), nicknamed "the Iron Horse", wis an American basebaw first baseman that played his entire perfaisional career (17 saisons) in Major League Baseball (MLB) for the New York Yankees, frae 1923 till 1939. 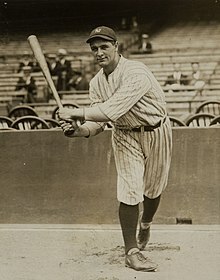 Gehrig wis renawned for his prowess as a hitter an for his durability, that earned him his nickname "the Iron Horse." He wis an All-Star seiven consecutive times, a Triple Crown winner ance, an American League (AL) Most Valuable Player twice, an a member o sax World Series champion teams. He haed a career .340 battin average, .632 sluggin average, an a .447 on base average. He hit 493 home runs an haed 1,995 runs battit in (RBI). In 1939, he wis electit tae the Baseball Hall of Fame an wis the first MLB player tae hae his uniform nummer (4) reteert bi a team. ↑ Castro, Tony (2018). Gehrig and the Babe: The Friendship and the Feud. Triumph Books. p. 144. ISBN 978-1-64125-004-7. ↑ 3.0 3.1 "Lou Gehrig Stats". Baseball Almanac. Retrieved July 11, 2017. ↑ "Henry Louis Gehrig". National Baseball Hall of Fame. Retrieved July 11, 2017.